Are you finding your home’s ambiance too plain and similar to other residences? Do you own an old historic home and wish to restore its old charm that incorporates sleek and modern amenities? Don A. Sigel of DAS Studio in Seffner, Florida has over 25 years of master carpentry experience in home restorations and is one of Florida’s top restoration contractors. His masterpieces for both home and office are seen in some of Tampa’s most historic buildings that showcase the charm of old Florida. 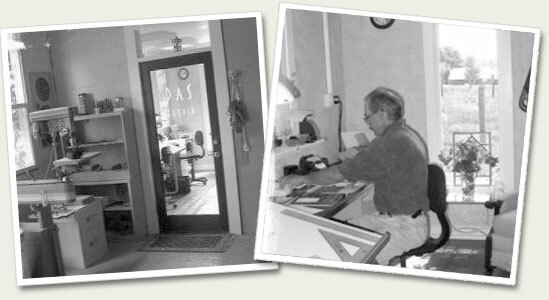 Continue reading and find out more about how Don and his associates at DAS Studio can revolutionize your living or work space with custom carpentry and design services. Work and living spaces occasionally require renovation and redesign to not only sustain their value, but maintain uniqueness and freshness as well. With over a quarter century of experience in restoring and remodeling residential and commercial properties all over Tampa and central Florida, no project is too small or large for Don. He specializes in everything from simple deck building and fireplace design to entire kitchen and home remodeling projects. And outdoor restorations like courtyards and front porches by DAS Studio mean you can bask under towering oaks or catch the warmth of Florida’s sun anytime. Add a magic touch to your project with DAS Studio’s Florida custom carpentry and design services. Find a wide variety of Don’s masterpieces from kitchen remodeling to custom built-in bookcases under the Carpentry Showcase section to the left. Accentuate your home or business space with custom wall finishes, paintings and murals specifically tailored to any theme from Don and artist Fran Clanton. Fran has over 25 years of experience providing high quality paintings and murals to homeowners, professional offices, restaurants, spas and nightclubs across the Tampa Bay metropolitan area. Her work takes her as far south as Naples, Florida, as far north as North Carolina and even as far west as Las Vegas! See some of Fran’s original works under the Painted Wall Murals section to the left. Original artwork not only beautifies your space but inspires as well. Contact Don and Fran today at (813) 833-9262 and discuss how custom murals and wall paintings can enhance the ambiance of your space. Over decades of restoration work and as a personal hobby, Don collects many items being salvaged from historic buildings around Tampa and central Florida. He has pieces for sale as well. Step back in time to Florida’s beginnings with wrought iron stair railings from the historic Sulphur Springs Hotel and Arcade. Or find a custom solid oak, stained glass confessional door built sometime in the 1920’s or ‘30’s salvaged from a historic Tampa church. Call Don at (813) 833-9262 to ask about these pieces and discuss your restoration project today. Copyright © 2019 DAS Studio for Home Restoration and Design - www.dasstudio.net All Rights Reserved.